Shane Bouchard had been accused of wrongdoing by a Lewiston woman who said she gave him rival's campaign emails. The Androscoggin County Sheriff's Office also cleared him of separate allegations. 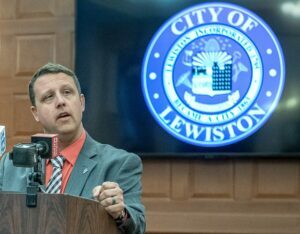 LEWISTON — Authorities said Tuesday there was no credible evidence of criminal wrongdoing or violations of state election laws by former mayor Shane Bouchard. Lewiston police conducted a joint investigation with the Maine Attorney General’s Office into possible crimes alleged earlier this month by a local woman who said she’d had an affair with Bouchard when he was running for mayor in 2017. Heather Everly Berube lodged public accusations against Bouchard during a City Council meeting in early March. She said she’d funneled campaign emails from his opponent in that race, Ben Chin, to Bouchard. Many of those same emails ended up being made public, having been posted on a GOP website, and may have influenced the outcome of the mayoral election. After making her initial allegations against Bouchard, Berube shared with the Sun Journal more than 150 texts between her and Bouchard — the bulk of which were from 2017 — that included a racist joke. The Sun Journal published a story that included the joke. In another text, he appeared to compare a meeting with his fellow Republicans to a Ku Klux Klan gathering. A day later, Bouchard resigned his post as mayor. Last week, Berube voiced more allegations against Bouchard at another council meeting, involving students at Oak Hill High School in Sabattus during his time as a wrestling coach there. According to Sun Journal archives, Bouchard coached at Oak Hill for at least four years, ending about a decade ago. Androscoggin County Sheriff Eric Samson said Tuesday the Maine Attorney General’s Office referred those Oak Hill allegations to his department, which has found no crime was committed after interviewing an alleged victim who was a student at the school at the time. Through his attorney, James Howaniec, Bouchard released the following statement Tuesday in reaction to the investigation’s findings. Berube has questioned the accuracy of the investigation, saying no one from the Attorney General’s Office ever spoke with her, and Lewiston police did not seem to take her seriously. “There was never an investigation,” she said in a statement released Tuesday. In early March, Berube said she had passed along to Bouchard emails from Ben Chin’s 2017 mayoral campaign. Berube acknowledged to the Sun Journal at that time she had shared the emails in a covert effort to boost Bouchard’s chances of becoming mayor by using the Chin campaign’s data and statistics against it. She said she believed Bouchard or his wife then gave the emails to Jason Savage, head of the Maine GOP and owner and operator of the conservative Maine Examiner website that published leaked emails. Bouchard has acknowledged getting internal Chin emails from Berube, but denied having a sexual relationship with her and denied that he or his wife forwarded the emails to Savage for publication. Earlier this month, after Berube publicly shared texts between her and Bouchard that included the racist text, he apologized. Bouchard said he was not racist and the comment was not a reflection on the way he feels about black people in general or Lewiston’s black residents in particular. “I say stupid things and stupid jokes occasionally,” he said.